Fabio Roversi Monaco was born in Addis Ababa on 18 December 1938, and graduated in Law at the University of Bologna on 28 February 1962. From 1972 to 2012, first he was Full Professor of Public Law (until 1975) and then Full Professor of Administrative Law at the University of Bologna. He served as a member of the Board of Administration of Bologna University from 1972 to 1979. 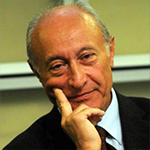 He was elected Rector of the University of Bologna on 1 November 1985 and remained in office for 15 years, until October 2000, having been elected four times. From 1978 until 2006, he was the Director of the Advanced School for Public Administration, Bologna, where he set up and directed the first Masters programme in Italy in Business Law. He is the author of numerous publications, including five monographs and many articles dedicated mainly to the theme of public intervention in the economy, State holdings, administrative decentralization, regional and municipal administration, and health law. He is a member of the Academic Advisory Board of many scientific journals and Founding Editor and Editor-in-Chief of the journals Diritto Sportivo and Sanità Pubblica e Privata. During his term of office as Rector of the University of Bologna, Prof. Roversi Monaco conceived and implemented the Magna Charta Universitatum, signed by 430 Rectors, gathered together in Bologna on 18 September 1988, and subsequently by a further 400 Rectors. All the leading European universities signed the Magna Charta, with a particularly strong presence of English, French, Polish and Spanish Rectors. The Magna Charta, the only written document on the basic principles of higher education adopted by the Universities in a spirit of autonomy, is considered the main reference point of Universities all over the world. In order to safeguard the principles of the Magna Charta, a Magna Charta Observatory was founded by Prof. Roversi Monaco in 2000. Its members are 2 representatives of the European University Association (EUA), the University of Bologna and other international organizations. The Observatory was chaired for seven years by Prof. Roversi Monaco, who is now Honorary President. Prof. Roversi Monaco served as President of Fondazione Cassa di Risparmio in Bologna from 2001 until May 2013. He is currently President of Banca IMI. He is President and CEO of the Museum of the City of Bologna s.r.l., set up by the Fondazione Cassa di Risparmio in Bologna to manage and coordinate the Genus Bononiae museums and artistic heritage. He is President of the Inter-University Association Almalaurea, the main European organization analysing student careers and post-graduate employment. Other current duties include: President of the Imola Piano Academy, and President of the Mozart Orchestra in Bologna, of which Claudio Abbado was Artistic Director. He is President of the European Secretariat for Scientific Publications (SEPS), a non-governmental organization with an advisory role to the Council of Europe, and of Bononia University Press. Honorary Degrees: Dickinson College, Carlyle (USA); Brown University, Providence (USA); University Complutense, Madrid (Spain); University Panthéon 1 Sorbonne, Paris (France); Johns Hopkins University, Baltimore (USA); Soka University, Tokyo (Japan); Universidad Externado de Colombia (Colombia); University of St Petersburg (Russia); University of Barcelona (Spain); University of Cordoba; Pontificia Universidad Cattolica, Belo Horizonte (Brazil); University of Salta (Argentina); Université de Montréal (Canada); Denver University (USA); Victoria University, Melbourne (Australia); Catholic University, (Uruguay); National University of La Plata (Argentina); University of Trieste (Italy); University of Maribor (Slovenia); State University of Samarkand (Uzbekistan); G. D’Annunzio University of Chieti and Pescara (Italy); Palacky University, Olomouc (Czech Republic). List of Honours: Knight of the Gran Croce of the Italian Republic; Chevalier Légion d’Honneur awarded by the President of the French Republic; Knight of the Ordine Civile di Savoia; Knight of the Ordem de Sant’Iago de Espada, Portugal; Croce di Grand’Ufficiale dell’Ordine al merito, Malta; Great Cross of Alfonso X the Wise, conferred by the King of Spain; Commander of the Order of Saint Louis of Polish Republic; Award for Merit Re Abdulaziz conferred by the Saudi Arabia Government; Paul Harris Fellow, awarded by Rotary International.